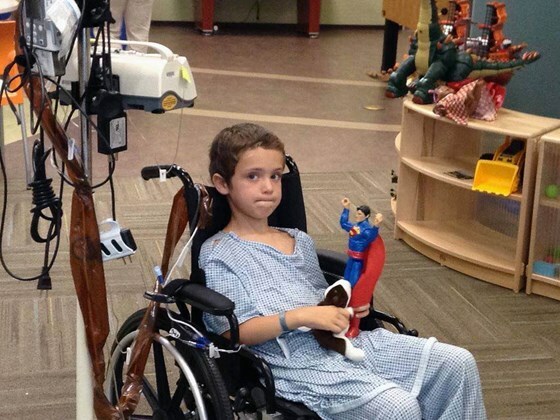 On July 3, 2015, seven-year-old James Susanka was kicked in the stomach by a calf at a Fourth of July event. In a freak occurrence, the kick fractured Jamie's pancreas. The small town of Lander, Wyoming had insufficient medical facilities for this level of injury, and Jamie and his mother Sarah had to be life-flighted to Salt Lake City. The doctors in Salt Lake City were hopeful that surgery might be avoided and the pancreas would heal on its own. However, this means that Jamie will be on a feeding tube for at least a month. He is unable to take any food or drink by mouth, including water. During Sarah and Jamie's ten-day stay at the SLC children's hospital, Jamie's older brother Mark, age 11, broke both bones in his fore-arm. The break required a trip to Salt Lake City for Mark as well, and will require several return visits. The medical costs for the Susanka family in the coming weeks will probably be in excess of $50,000. A life flight from Wyoming usually runs between $40,000 and $60,000, and it is not covered by their insurance. Also, while some of Jamie's equipment is covered, the formula in the feeding tube is not. Thank you for your generosity and prayers on behalf of this wonderful family!